Iran’s regime has celebrated the victory of pro-regime forces in Palmyra in central Syria, hailing Iranian coordination with the Russian and Syrian militaries and Lebanon’s Hezbollah. On Sunday, a weeks-long offensive reclaimed the Roman-era city from the Islamic State, which had occupied the area since May 2015. The victory was enabled by Russian airstrikes, with Hezbollah units, Iranian Revolutionary Guards, and Iraqi and Afghan militia alongside the Syrian military on the ground. 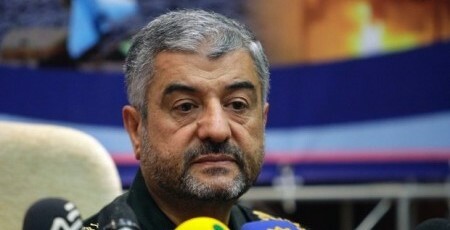 The commander of the Revolutionary Guards, Mohammad Ali Jafari, told reporters at a ceremony honoring Iran-Iraq War veterans that “the situation in Syria is very good”. He said that Palmyra demonstrates Russia’s coordination with “the Resistance Front” which “has been practicing for the mobilization of the Islamic world against the enemies”. “Now, the situation in Iraq, Syria, and Yemen is good; the situation is moving in favor of the Islamic Revolution,” Jafari asserted. The Secretary of the Supreme National Security Council, Admiral Ali Shamkhani, congratulated the Syrian army and said Iran will continue to support the Assad regime in the “fight against terrorism”. Defense Minister Hossein Dehghan also congratulated his Syrian counterpart, Fahd Jassem al-Freij. Iran has provided essential political, economic, and military support for the regime since the start of the Syrian uprising in March 2011. In 2012, the Revolutionary Guards created the National Defense Forces militia, with a goal of 50,000 members, to supplement the overstretched Syrian Army, and it encouraged Hezbollah’s intervention in spring 2013. Last summer, Russia and Iran arranged the Russian military intervention which began September 30, with thousands of airstrikes backing ground offensives including Iranian and Hezbollah forces. Since October 7, the deaths of more than 220 Iranian commanders and troops have been confirmed by the Islamic Republic’s media. President Rouhani spoke by phone with Russian counterpart Vladimir Putin on Monday to highlight the Palmyra success. Rouhani put out ritual lines that ““it is only the people of Syria who can decide on Syria and the future of the political system”, while declaring that Iranian-Russian “collaboration is necessary for stabilising bases of peace and tranquility”. PreviousAustralia’s ABC Radio: Will Brussels Attacks Put Donald Trump in the White House?